A three bean salad recipe when made from dried beans that you have cooked yourself can be quite delightful! Believe me, it will not taste like the tired bean salads you buy in a grocery store deli. It's not complicated to just boil the beans. You don’t even have to soak them if you are in a pinch for time. They just taste so much better when you have made them fresh. When I am having them with Mexican food or I've just made a last minute decision to have them, canned beans are fine but when they are the star of the show so to speak, as in a salad, it’s worth the extra effort to make them from scratch. The three beans I like to use in this salad are garbanzos, black beans and adzukis. The garbanzos really bring zip to a salad because they are so crunchy. The black beans and adzukis are soft and very mild and soak up the dressing well. If you do remember to soak them overnight they will hold together well and look nicer in a salad. Cook the beans in the morning if possible and refrigerate. They will be completely chilled by the time you are putting your salad together. Boil them separately as they need different times and the garbanzos will turn black if boiled with the other beans. Rinse beans thoroughly to remove dust and dirt and put in 3 separate pots covered with 2 cups of water. Bring each pot to a boil and simmer. The adzukis take about 40 minutes, the black beans and garbanzos about an hour. When they are done drain them and put them together in a bowl and refrigerate while you are preparing the vegetables and dressing. If you were able to cook the beans in the morning all the better. Rinse the peppers, cut off the ends, remove the seeds and rind and slice them in half down the long end and then in quarters. Now you can slice them thin crosswise. Finely chop the onion. Rinse the parsley and cut off the ends of a big bunch. Chop fine and measure enough for a cup. Make the dressing in a small jar by combining the last 6 ingredients and shake well. Now you’re ready to assemble the salad. Bring out your beans, add the vegetables first and stir well. Then add your dressing and stir again until the beans and veggies are thoroughly moistened. You are ready to eat! 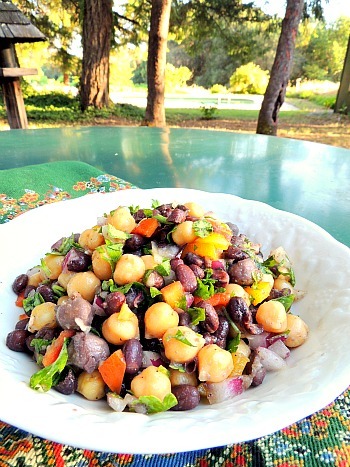 This three bean salad recipe is great for a crowd when you scale it up or to take on a picnic because it keeps so well. It just gets more flavorful over time and will keep for a week in the refrigerator. Eat lightly when you eat beans since they are starchy. Don't eat them at night! Even though they are full of fiber, phytochemicals and antioxidants, some people have difficulty digesting them. If you are one of them you will want to be physically active after eating them and not just be going to bed. Adzukis are the easiest beans to digest so you may be just fine. Soaking helps reduce the gaseous effects. So does getting enough exercise. Beans are full of nutrients. They are versatile, nutritious and very cheap! When you eat them with brown rice you have a complete protein. They really are super foods and so delicious when you take the time to prepare them right. Return from Three Bean Salad Recipe to Low Glycemic Recipes. Return from Three Bean Salad Recipe to Lifetime Fat Loss home page.